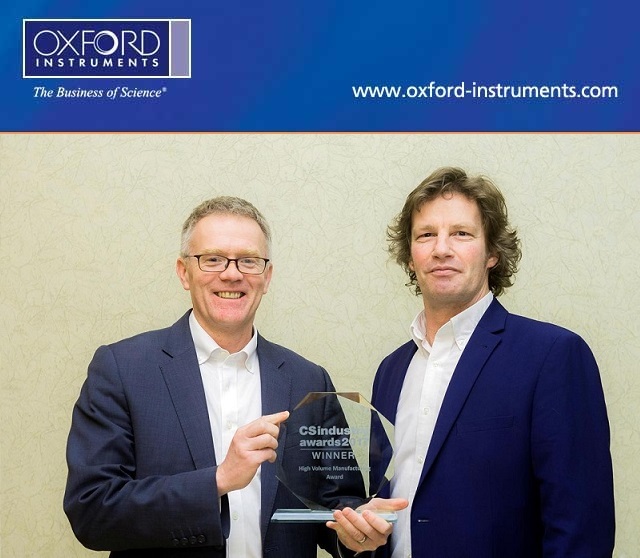 We are delighted to announce that Oxford Instruments Plasma Technology has received the High Volume Manufacturing Award at the annual CS Industry Awards held on 7 March 2017 in Brussels. The award highlights the company's development of the SiC via plasma etch process, using the company's own tool, the PlasmaPro100 Polaris system. SiC is becoming an increasingly important material, particularly for high performance GaN RF devices using SiC as a substrate. A smooth via etch through the SiC is essential to the functioning of these devices. high selectivity to underlying GaN layer giving a smooth, low damage stop onto the GaN device layers. high utilisation provided by long Mean Time Between Cleans (MTBC).